The Kelly 60 in. vanity features a new soft grayish blue finish with transitional styling that would complement any bathroom. Hand-crafted out of Solid poplar wood and veneer and MDF. Two dove tailed DWR boxes with soft close glides are finish with antique nickel door pulls. The Tropica 30 in. vanity adds warmth with a touch of nostalgia to your bathroom. Offered in a rich antique brown finish over solid Poplar and veneer construction. Its features include soft-close cabinet hinges, adjustable height levelers and bottom open shelf for storage. It is accented with brushed nickel hardware. This beautiful cabinet is a great edition piece to match existing vanity, and add extra counter and storage space. Wenge-wood finish with a marble top. Solid brush nickel finish hardware to compliment the sleek design. Soft close drawer glides. Dimensions: 15.7wx18dx30.4h Faucet and mirror not included. Professional installation recommended. Hatton 59-Inch Vanity Cabinet with Mirror in Dark Chestnut Bring a feeling of texture and depth to your bath with the gorgeous Hatton vanity series - hand finished in warm shades of Dark or Light Chestnut, with brushed nickel. A contemporary classic for the most discerning of customers. The Wyndham Collection is an entirely unique and innovative bath line. Sure to inspire imitators, the original Wyndham Collection sets new standards for design and construction. Available in multiples sizes and finishes. 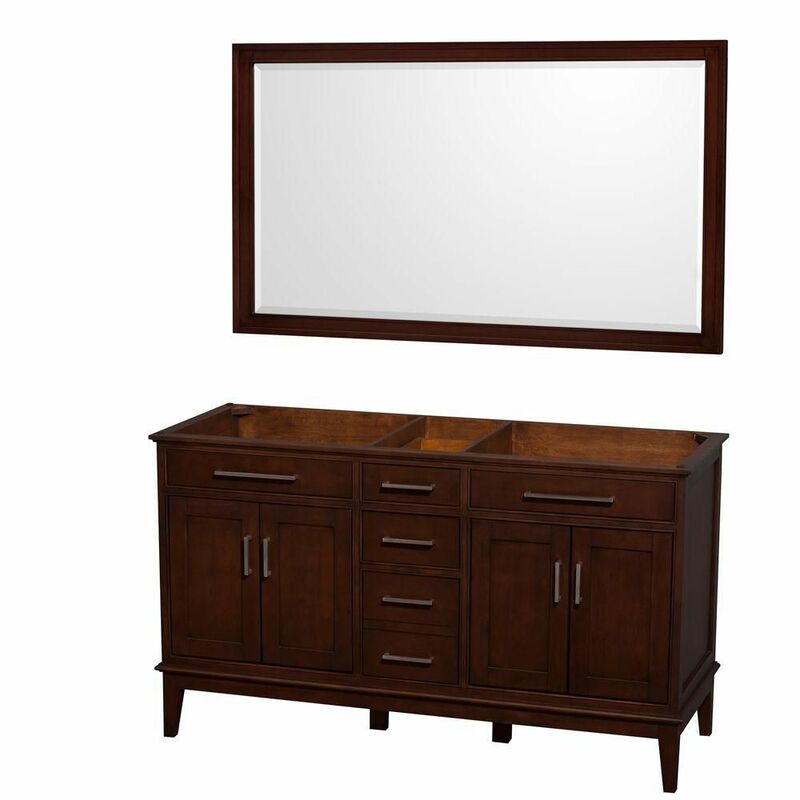 Hatton 59-Inch Vanity Cabinet with Mirror in Dark Chestnut is rated 5.0 out of 5 by 1. Rated 5 out of 5 by Tom from Beautiful, well made, nicely packed and delivered quickly. Soft closing doors and drawers are a ... Beautiful, well made, nicely packed and delivered quickly. Soft closing doors and drawers are a nice touch.